Food has the incredible ability to transport you to any location at anytime. Whether it’s the smell of freshly baked baguettes that reminds you of your favorite boulangerie in Paris or the preparation of your favorite meal that brings you right back to your kitchen at home, the power of food is insurmountable and incomparable. Being in Paris means that I'm a a long way from my home in Miami. I often miss eating a home cooked meal with my family, which happens to be comprised of several great cooks, each with their own specialty. To remedy this homesickness, I’ve taken to the kitchen. I made some FaceTime calls to get the recipe from my mom and was lucky enough to have my aunt visiting me when I tackled this project. She was on the scene to offer some help and guidance when I got stuck. 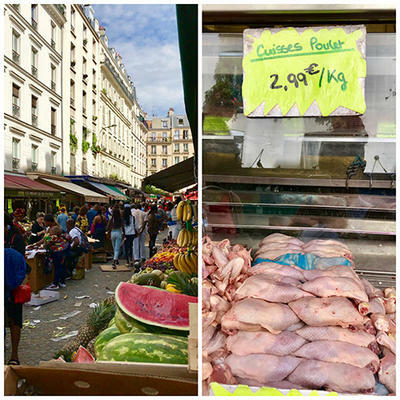 Paris is, without a doubt, one of the gastronomical capitals of the world. It also happens to be home to a diverse group of communities from all corners of the world. 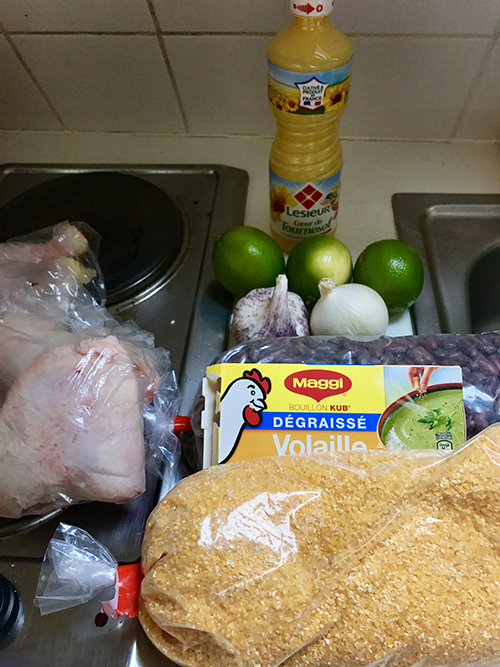 This comes in handy when I’m looking to buy all the ingredients to make one of my favorite meals - poulet créole en sauce avec maïs collé (chicken creole in sauce with cornmeal and beans). So I hopped on the metro and went over to the 18th arrondissement to find all the ingredients I needed. 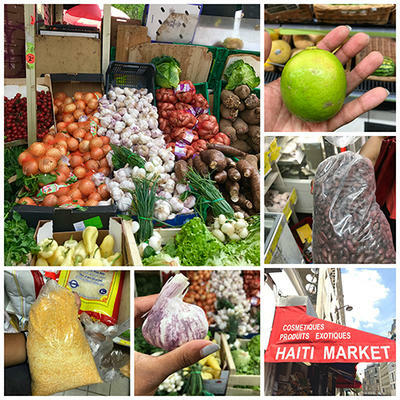 My first stop, naturally, was Haiti Market. This is where I purchased all my produce: a lime, 2 onions, and a bulb of garlic. I also picked up some Maggi, a specific brand of cubed seasoned salt. and for the main dish, I bought a kilo of coarse maïs moulu (cornmeal) and a kilo of dry red beans. This was a much greater quantity than I need to make one meal but those were the smallest packages available and the deals couldn’t be beat! All of this cost under €10! Next, I went down the street to Rue Dejean. This street is packed with vendors and their loyal buyers on Saturdays, selling everything from watches to watermelons. The hustle and bustle of this street is unique to the people who bring it to life, and it’s quite the experience getting to be a part of that, even if just for a few moments. 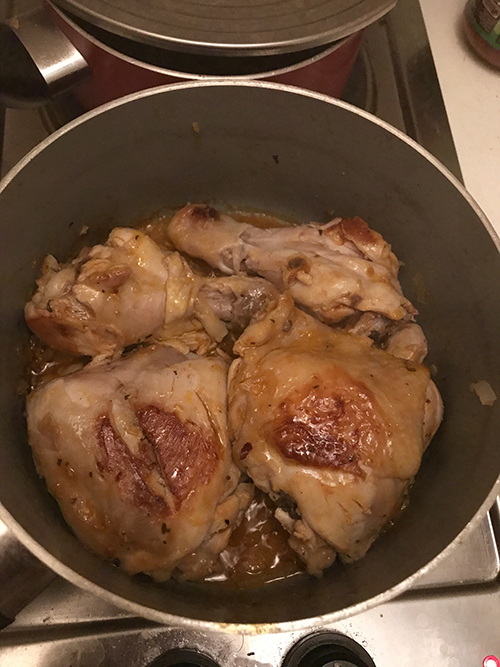 I made my way over to one of the butcher stands and proceeded to buy what I needed for the protein of the dish- chicken thighs. After a friendly exchange with the butcher, I was on my way back to my apartment to commence the preparation of this meal. 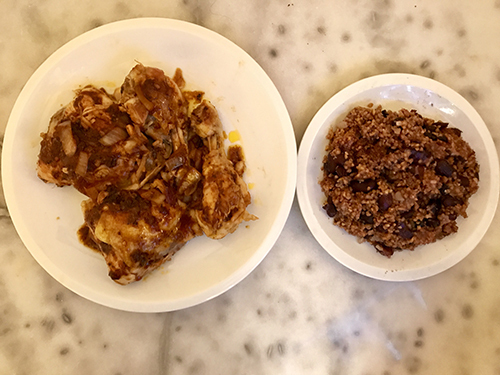 This meal is not the quickest in terms of preparation and cooking time, but the final product is definitely worth the effort. 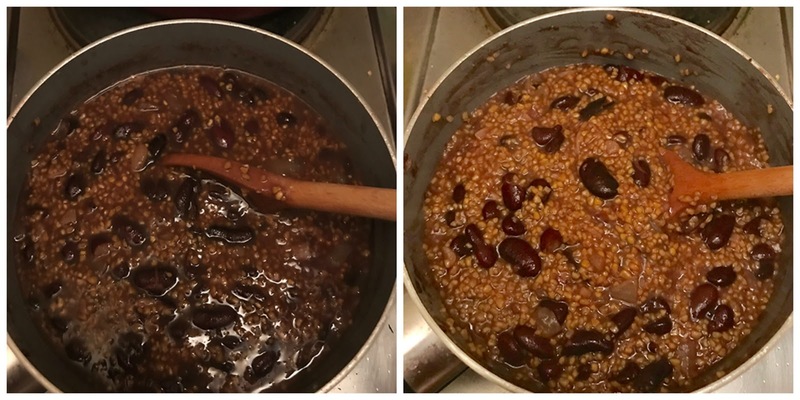 The bulk of the preparation time comes from cooking the beans. 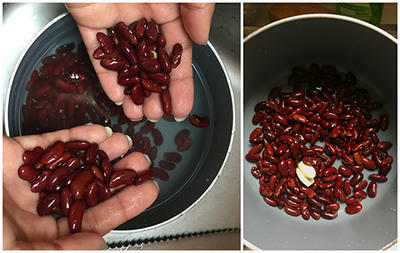 To start, rinse the beans thoroughly with water. Measure out ½ cup of beans, place them into a bowl, and run water over them. Run your hands through the beans to make sure you get all of the dirt off of them. 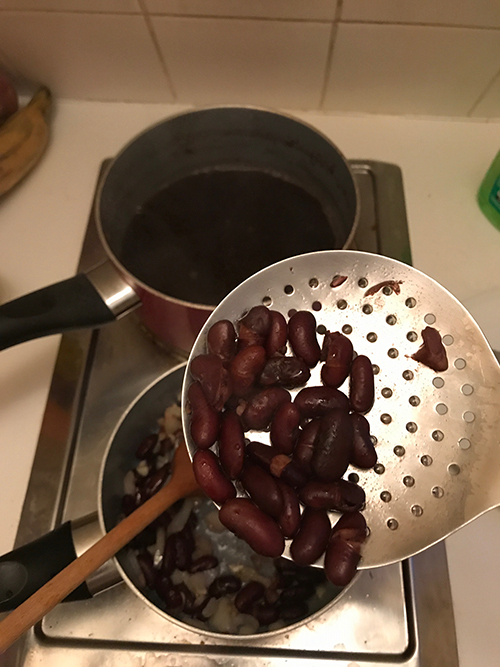 Next, drain the beans and place them into a pot with 2 whole cloves of peeled garlic, a pinch of salt, and 3 cups of water. 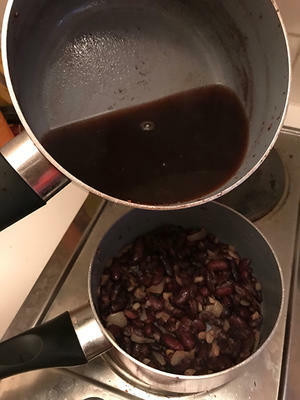 Put medium heat under the beans and cover them. Let the beans cook for 1 to 1½ hours, until they are thoroughly cooked and semi-soft. Make sure to check them periodically as the water may completely evaporate. In this case, simply add more water and continue cooking. While the beans are on the stove, season the chicken. The pieces of chicken I purchased were on the large side, so I cut them in two. This, along with making incisions in the flesh (see image below) allows for more surface area to absorb the seasoning. Next, the chicken must be thoroughly cleaned and disinfected. To do this, start by boiling approximately two cups of water. Then, with the chicken in a heat-resistant container, rub it down with lime halves (two should suffice). When the water comes to a boil and the chicken has been coated in lime, carefully pour the boiling water over the chicken and let it sit for 2-3 minutes. I recommend doing this in a sink for minimal cleanup in the event of water spilling over. 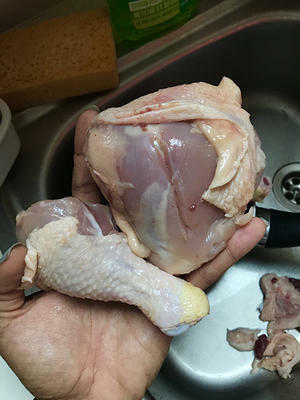 After the chicken has sat in the hot water for 2-3 minutes, drain the water and move the chicken into a container big enough to season it. For the seasoning, mix the juice of 1 lime, 1 cube of Maggi, 1 onion (chopped), and 3 large cloves of garlic (also chopped) in a small bowl. 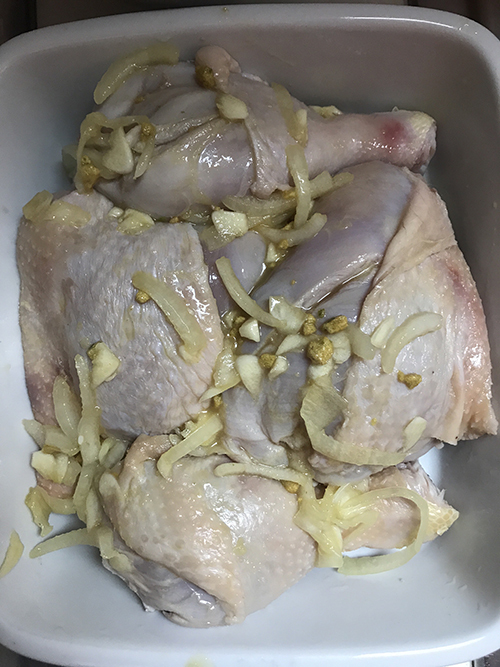 Pour this mixture over the chicken and turn the chicken over in the seasoning repeatedly to assure that every inch of chicken is seasoned. Next, cover the chicken and place it in the fridge until you are ready to cook it. After about an hour, the beans should be soft. Using a draining spoon or a skimmer, transfer them into another pot. Keep the water that they were cooked in; you’ll use this to cook the maïs (cornmeal). Sauté the beans in 2 tablespoons of oil with ¼ of an onion, chopped; 2 minced cloves of garlic; and salt to taste. After these ingredients are sautéed, add the water from the beans and 1 cup of cornmeal to this pot. Stir continuously for 3 minutes or until the cornmeal begins to absorb most of the water. Then, leave the pot covered and on low heat for approximately 10 minutes, stirring the cornmeal and beans every minute or so. Now to cook the chicken. Place the seasoned chicken in a pot with roughly 3 tablespoons of water and set it on the stove over medium heat. If you have tomato sauce or tomato paste handy, add 2 tablespoons to the pot to give the chicken some color. The tomato flavor also helps bring out the flavors from the seasoning. Leave the chicken cooking on the stove, covered, for approximately 25 minutes, checking on it occasionally and flipping it halfway through. 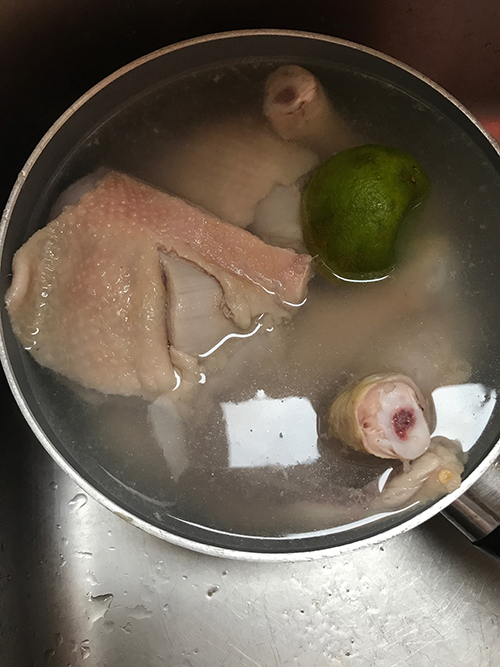 Once the chicken is fully cooked and tender (there should be no pink parts when it is cut into), remove it from the pot. Preserve the juices it made while being cooked; this will be the base of the sauce. 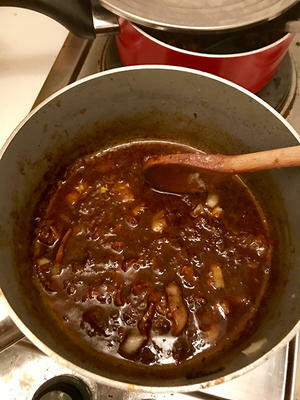 In the same pot in which you cooked the chicken, add ¼ cup of water and ¼ of a onion, chopped. Feel free to add some tomatoes or red bell peppers as well, if you have some available. Let this simmer before pouring on top of the chicken, la pièce de résistance! The meal is officially complete! All that is left to do is serve the chicken with the sauce and maïs with the beans and enjoy your home cooked Haitian meal!